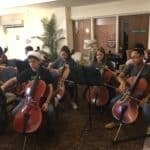 Thank you Annemarie Abraham and our talented TMYO musicians for heading out on the TMYO Retirement Home Tour this weekend. You brought love and joy to the people in our community who need it the most. Wishing all you the happiest of times 🎶❤️ this Holiday Season!